Place potatoes in a 9×13 baking dish. Toss with oil, thyme and season with salt and pepper. Roast for 30 to 45 minutes in a preheated 375 degree oven until browned and tender. Set aside. Drizzle a bit of olive oil on the steak. Season with salt and pepper. Either grill steak or broil in the oven until to desired doneness. Set aside. Divide torn romaine and roasted potatoes between 6 plates. 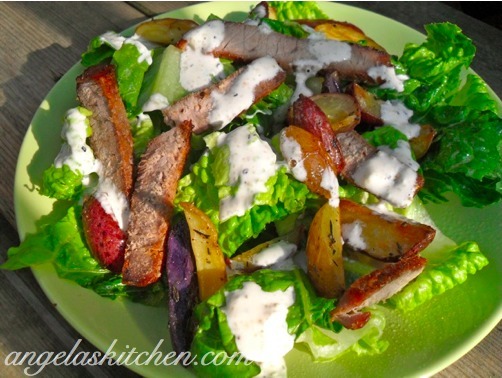 Thinly slice the steak and put on the salad. Top with desired dressing the sprinkle with the green onions. Green Herbed Dressing: In a bowl combine 1/2 cup chopped fresh Italian parsley (or fresh cilantro), 1/4 cup extra-virgin olive oil, 3 tablespoons chopped fresh chives, 3 tablespoons drained minced capers, 2 teaspoons chopped fresh oregano, 1 teaspoon chopped fresh thyme, and 2 cloves minced garlic. Season with salt and pepper.